The collection includes 62 models of plants (exotic plants, garden plants, bushes and trees). The collection includes 64 models of lowpolygon 3D buildings where you can find houses, skyscrapers, blocks and other buildings. Evermotion Team offers you an Archmodels 63 Collection a complete new way of creating your own scenes for professional exterior renders. There are no boundaries anymore, no limitations except your own imagination. With just a few mouse clicks you can prepare beautiful hedges and walls around your buildings, colorful lawns, realistic stairs and streets that will breathe life into your scenes.This collection comes with 38 sets with over 470 visualization puzzles. High detailed models of orient gadgets where you can find sculptures, statuettes, decorations, ornaments, embellishments, ornamentation, scenery, adornments with all textures, shaders and materials. It is ready to use, just put it into your scene. Highly detailed models of plants with all textures, shaders and materials. It is ready to use, just put it into your scene. 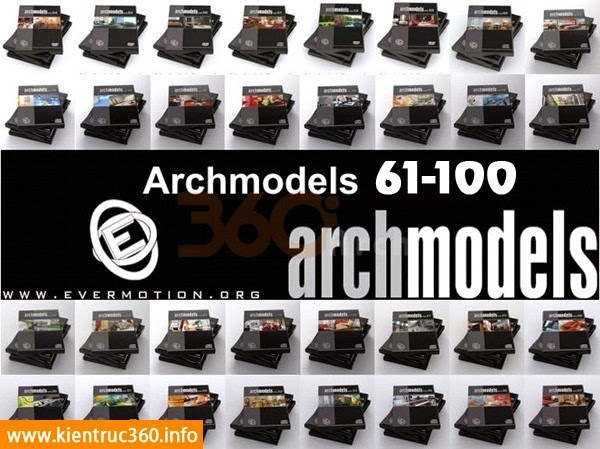 Archmodels volume 69 gives you 66 professional, highly detailed objects of kids toys (consoles, mascots etc. ), children room equipment (beds, lamps etc.) and playground equipment (sandbox, swing etc.). This collection includes 125 highly detailed models of CASAMANIA design with all textures, shaders and materials. This collection includes 20 highly detailed models of airplanes and airport equipment with all textures, shaders and materials. This collection includes 65 highly detailed models of plants with all textures, shaders and materials. This collection includes 50 highly detailed models of electrionic appliances with all textures, shaders and materials. This collection includes 40 highly detailed models of small electrionic appliances with all textures, shaders and materials. This collection includes 154 highly detailed models of architectural ornaments and railings with all textures and materials. Eileen & Frank is a novel luxury-class modular shelf system designed for AANDRES by Andy Andresen. A modern shelf unit with classical characteristics, Eileen & Frank consists of perfectly assimilated individual elements. Due to a combination of ideally-aligned components, the system provides a broad variety of possible combinations and can be easily assembled. This collection includes 40 highly detailed models of sport equipment with all textures, shaders and materials. It is ready to use, just put it into your scene. High detailed models of kitchen appliances with all textures, shaders and materials. It is ready to use, just put it into your scene. High detailed models of animals with all textures, shaders and materials. This collection includes 30 military models with all textures, shaders and materials. You will find here military trucks, tanks, helicopters, jet planes, boats and weapons. This collection includes 50 professional models of tropical trees with all textures, shaders and materials. This collection includes 60 professional models of office appliances with all textures, shaders and materials. You will find here commercial grade copy machines, printers, paper shredders, vending machines, dispensers, telephones, fax machines, calculators, file binders, office furniture, etc. It is ready to use, just put it into your scene. This collection includes 60 professional models of Christmas decorations with all textures, shaders and materials. You will find here a wide variety of Christmas gadgets like Christmas trees, wreaths, socks, chains, gifts, candlesticks, fir, glass balls and pinecones. This collection includes 70 professional models of office furniture with all textures, shaders and materials. You will find here office desks, chairs, tables, cabinets, computers and monitors. This collection includes 70 professional models of beauty parlour appliances and furniture with all textures, shaders and materials. You will find here backwashes, stand hairdryers, salon trolleys, beauty beds, hairdressers armchairs, scissors, hairbrushes, combs, shavers, razors, cosmetics, etc. Archmodels vol. 93 gives you 12 highly detailed models of motorbikes with textures, shaders and materials. Archmodels vol. 95 includes 94 highly detailed models of home and security gadgets with all textures, shaders and materials. You will find here home automation, intercom and security systems, security cameras, tv antennas, window shutters, roller shutters and awnings. Archmodels vol. 96 includes 65 highly detailed models of toys with all textures, shaders and materials. You will find here a great variety of children mascots, teddy bears, dolls and toy cars. Archmodels vol. 97 includes 64 highly detailed models of fireplaces with textures, shaders and materials. Archmodels vol. 98 includes 13 highly detailed models of vehicles with all textures, shaders and materials. Archmodels vol.99 includes 80 highly detailed models of modern lamps with all textures, shaders and materials. Archmodels vol. 100 includes highly detailed models of autumn and winter trees with all textures, shaders and materials.